'Cause love don't come in black or white"
Don't let those big eyes and young look deceive you...Diane Birch sings with a maturity far beyond her years. Think Carole King, Linda Ronstadt and Stevie Nicks talent. 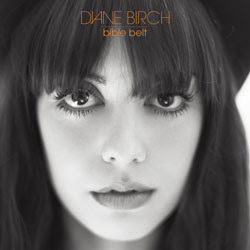 She impresses in her debut album Bible Belt , combining a powerful voice, skillful piano playing and superb song writing. Listening to her music is like riding a retro time machine back to the music of my childhood years. Birch describes herself as an "old soul." Old soul she may be, but she's managed to make herself a new favorite as well. Birch combines many great musical styles seamlessly together, creating a sound all her own...gospel, doo-wop, country-blues, 70's pop. The music is a refreshing change from the standards on the radio today. I love so many of the songs on the album it is hard to choose my favorite. The gospel-like "Rise Up" ranks high on my list, as well as "Fire Escape," the opening song sung with such feeling. Bible Belt released on Tuesday June 2nd and has already hit the billboards. Watch Birch in action - She's set to perform "Nothing But A Miracle" on "The Late Show With David Letterman" on CBS on Wednesday, July 22nd! Thanks to One2One network for this review opportunity.